Audio snobs may already be boasting their high-end audio equipment, be it portable headphone amps or a special chip inside their smartphones, but these are no good if your ears have slight hearing loss. Even if you deem your ears to be pitch perfect, chances are your left and right ears have different sensitivity to certain frequencies. The solution? 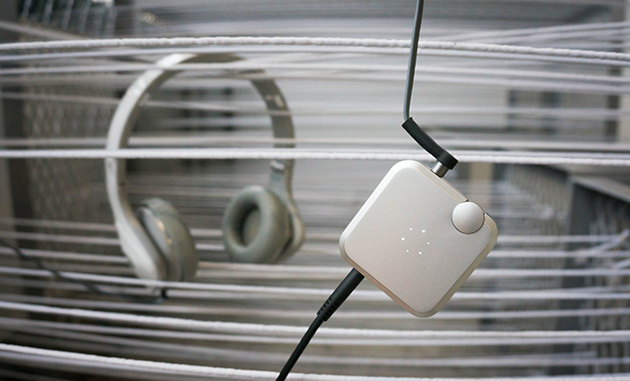 A startup in Hong Kong has come up with a little device called Aumeo, which lets you fine-tune your headphones according to your ears' hearing sensitivity. This author has tried it, and the result was pleasantly surprising. I actually first met the company's co-founder, Paul Lee, a little over two years ago when he came up with this handy technology, though he had other plans back then. Today, after a clinical trial with 100 subjects, Lee has decided to take the Aumeo to Indiegogo for general consumers. The idea is simple: plug the Aumeo's headphone jack into your iPhone or Android smartphone, then plug your headphones into the Aumeo, and then run the companion app's hearing test. The simple test lets you indicate how much of each of the six frequencies -- 250 Hz, 500 Hz, 1 kHz, 2 kHz, 4 kHz and 8 kHz -- your ears can hear independently; just move the slider until you can just about hear the beep. When all done, the profile is cunningly sent to the Aumeo in the form of audio signal, so no Bluetooth is required. Once you're set, you'll no longer have to run the app again as the profile is stored on the Aumeo, but you can always run it again should you wish to hook the aluminum device up to other headphones. According to the quick setup process, my hearing sits in the "satisfactory" region, with both ears slightly lacking in the 500 Hz range and 8 kHz range. I then put on some music through my KEF M200 and was blown away by what I heard: I was able to pick up more detail in the music, while also finding myself having to lower the volume slightly, as I didn't need it to compensate what I couldn't hear clearly. There was no cheating as the audio wasn't louder, just more detailed. The Aumeo is now live on Indiegogo starting from $99 (free US shipping) which, in our opinion, is well worth the investment -- especially when it comes with a pair of allegedly decent earbuds as well. You can even go for the Duo Pack offer which is just $169.